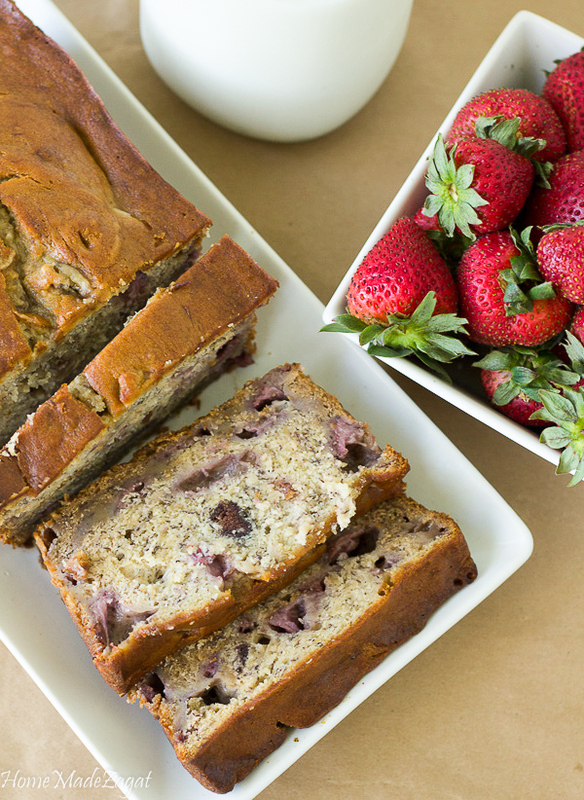 A moist banana bread paired with sweet strawberries. 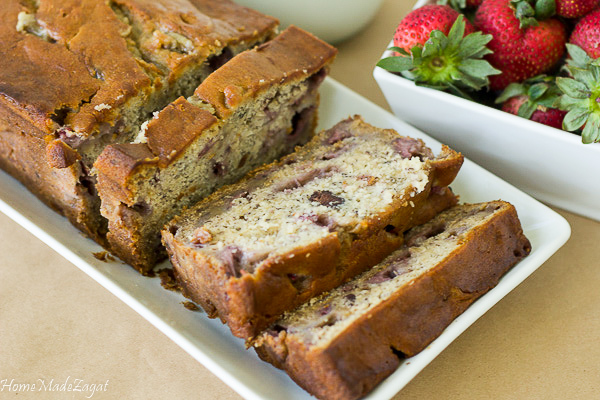 Perfect for breakfast, dessert or summer snack. I did a roundup of potatoes and I did my fried stuffed potatoes that were a hit. Well, considering it's now summer, this time, the focus is on strawberries. South Florida has them in "Ah bun dunce" now so I gladly opted to contribute a moist banana bread, with the addition of some chunks of fresh, sweet Florida strawberries. The perfect snack for the summer heat. I looove banana bread. I am the "buy banana, hide banana, to use the banana" person in the house. You will find bananas wrapped in brown paper bags hidden behind the oil in the cupboard because I do not want anyone to use the bananas. I like to use ripened bananas too to make my bread. That way I can use less sugar and the bread is just naturally sweet. Then incorporate some chunks of sweet strawberries. I make sure to use strawberries that are firm i.e no bounced skin. Those I just pop in my mouth or freeze them for smoothies. I love that banana bread is an easy fix. Smash, mix and bake. Doesn't require any fancy equipment and amazing technique. It's all about simple food! Do you have a lot of strawberries around this season? What are your plans for them? Mix butter and sugar until fluffy. Fold strawberries into the mixture.